Though higher in fat than most of our recipes, this delicious side dish is a great source of Omega 3 fatty acids. Serve with your favorite vegetarian sushi. 1/2 teaspoon soy sauce, or to taste. Bring pot of water to a boil and salt it; blanch beans in water until they are bright green and just tender, about 5 minutes. Drain and refresh in cold water, then drain again. Place in a serving bowl. 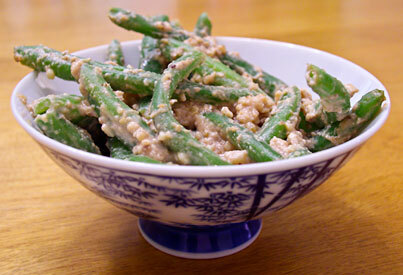 Toss beans in sauce, and serve at room temperature. Adapted from a recipe by Yumiko Kano.